President Donald Trump speaks on the South Lawn of the White House Sunday as he walks to Marine One in Washington. WASHINGTON — President Donald Trump held out little hope Sunday that another round of talks between top aides and congressional staff would produce meaningful progress toward ending the partial government shutdown, seeming to undercut his team by saying he needed to deal directly with Democratic leaders. “Ultimately, it’s going to be solved by the principals,” Trump told reporters at the White House before leaving for staff meetings at Camp David as the shutdown headed into its third week. A second round of discussions between administration officials and Capitol Hill aides was scheduled for Sunday afternoon. 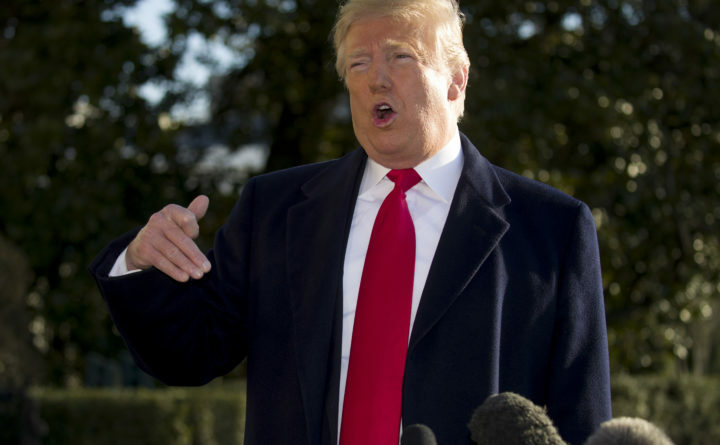 With Trump insisting on $5.6 billion for the wall and Democrats resolute in saying they won’t go along, Trump reaffirmed that he would consider declaring a national emergency in an effort to circumvent Congress and spend money as he saw fit. Such a move would seem certain to draw legal challenges. He said he planned to call the heads of American steel companies in hopes of coming up with a new design for the barrier he contends must be built along the southern border. Trump had previously promised a concrete wall, but now says it could be made of steel slats. His administration has already spent millions constructing wall prototypes near the border in San Diego. The White House team appointed by Trump met with congressional aides on Saturday and reported no breakthrough. After being briefed by Pence, Trump tweeted that the group had not made “much headway. With the talks stalled, Pelosi, D-California, said House Democrats intended to start passing individual bills to reopen agencies. The first would be the Treasury Department, to ensure people receive their tax refunds. Democrats said the White House did not budge on the president’s demand for the wall money. The White House said money was not discussed in depth, but the administration was clear about the need for a wall and the goal of resolving the shutdown all at once, not piecemeal. A White House official said the meeting included a briefing on border security by Homeland Security Secretary Kirstjen Nielsen. Democrats sought written details from the Department of Homeland Security on their budget needs; the White House said it would provide that. Mulvaney said Trump was willing to forgo a concrete wall for steel or other materials. “If he has to give up a concrete wall, replace it with a steel fence in order to do that so that Democrats can say, ‘See? He’s not building a wall anymore,’ that should help us move in the right direction,” Mulvaney told NBC. The president has suggested his definition of the wall is flexible, referring to slats and other “border things.” Democrats have made clear they see a wall as immoral and ineffective and prefer other types of border security funded at already agreed upon levels. Trump had campaigned on the promise that Mexico would pay for the wall. Mexico has refused. He’s now demanding the money from Congress.